One of Italy’s best-kept secrets, the small northern town of Ferrara is off the itinerary of most travelers, which makes discovering it all the more rewarding for those in the know. Encircled by medieval walls stretching more than nine kilometers and home to an enchanting castle and darkly beautiful cathedral, this lesser-known Renaissance town is only a half-hour train ride from Venice and 50 kilometers from gourmet Bologna, although its quiet streets are worlds away from the cities’ hustle and bustle. Ferrara is an absolutely wonderful place to explore by bike, and locals and visitors alike pedal their way around town. There are several places to rent bikes near the center. Best-known for the small yet intricately decorated Renaissance palaces that dot the center, Ferrara is a favorite with architecture buffs. It also has wonderful art collections, like the National Picture Gallery, where masters of the Ferrara School give proof of the town’s long cultural heritage. Yet not all of the town’s charms come from the past. The 12,000 students at Ferrara’s University (where Copernicus studied) infuse the streets with a vibrant, lively atmosphere. The laid-back café culture and welcoming restaurants here make this an easy place to while away a couple of days. Ferrara is also a fantastic place for food and wine lovers to visit, as you have ham producers, Parmigiano makers, wineries, balsamic vinegar “acetaias” and grappa producers all within easy reach. A fortified city as far back as the Byzantine era, this small town in the Emilia-Romagna region followed the destiny of so many northern towns, becoming an independent commune (“independent” is a relative term; the city was controlled by the powerful Este family) in the 12th century. It thrived as a cultural and artistic hotspot for centuries, before becoming part of the Papal States and eventually becoming part of a unified Italy in the 19th century. Many of its most notable plazas, palaces, and monuments date to the 14th century when the Este family held court here and invested vast sums of money in bringing the city up to their standards. Ferrara, which sits on the northeastern edge of the Emilia-Romagna region near the Veneto, reveals the influence of both regions’ cuisines. As in the rest of Emilia-Romagna, restaurants here serve generous plates heaped with egg-based pasta heaped with fragrant ragù sauce, thick soups made with local legumes or fresh vegetables, crusty wheat rolls called coppiette (Ferrara is famous for this bread), and the crisp fritters that are ubiquitous in the area. Traditional local food like “Salama da Sugo”, a heavy winter dish of cooked salami made with different meats. Eel is very typical, coming from the Polesine area (“Delta del Po”, where the Po River spills into the sea), for example around Goro. Clams from the delta are also common on restaurant lists. 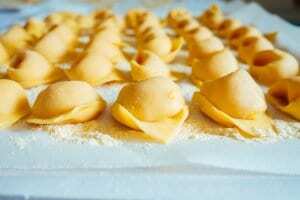 Classic Ferrara dishes include “Panpepato” (Christmas chocolate cake), “Cappellacci di Zucca” (a type of ravioli stuffed with pumpkin), and Pasticcio Alla Ferrarese (a delicious meat pie). There are also Jewish influences in the local cuisine. Ferrara’s kitchens focus more on seafood than do those in other cities in the region (Bologna, Parma, Modena), reflecting a Venetian touch. Food Anecdote: The traditional Italian dessert, “Zuppa Inglese” (which literally means “English soup”) was invented in Ferrara at the Este court in honor of the visiting English noblewoman, Lady Hamilton. It is an Italian form of English trifle, laced with alchermes, an Italian vanilla based liqueur. The Este family, so powerful during the Renaissance, were famous for their court’s gastronomic heritage. Citywide restaurant wine lists are similarly varied, with Prosecco and Amarone from the nearby Veneto sharing space with Emilia-Romagna’s easy Lambruscos, the nectar-like Albana Passito, jammy Sangiovese di Romagna and fragrant Cabernets. 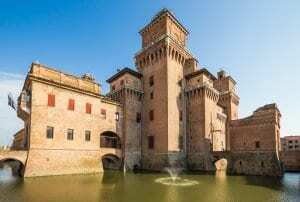 Ferrara, which sits on the banks of the Po di Volano River (a branch of the Po), actually sits outside the major wine-growing areas, nearly all of which are southwest of Bologna. The former stronghold of the ruling Este family, this medieval castle with a moat dominates Ferrara’s old town much as it did when this was the center of the area’s power and prestige. The Cathedral of San Giorgio, dating to 1135, effortlessly combines Romanesque and Gothic architecture to wondrous effect. Nicolaus Copernicus and Paracelsus both studied at Ferrara’s university, which was founded in 1391 and still has schools of law, architecture, pharmacy, medicine, and natural science. More than 9km of defensive walls dating to the 15th and 16th centuries wrap themselves around old Ferrara. Ferrara is considered one of the best places to see Italian Renaissance architecture, thanks to the considerable number of 15th and 16th palaces here. While these palaces aren’t the most opulent you will find, their small scale makes them even more appealing. The best-known palace is the Palazzo dei Diamante, now home to the National Picture Gallery, which showcases an impressive collection of works from the Ferrara School. From the 17th- 19th centuries, Ferrara’s Jewish community was pushed into a ghetto near the Castello Estense. These days, you can visit the old synagogue and an interesting Jewish museum on the Via Mazzini.